48 APRIL 2018 | Med Esthetics COLLAGEN BUILDERS Clinical Resolution's Age Defying Liposomal Retinol Serum is a youth recovery complex that works on a molecular level to repair skin, stimulate collagen production, increase cellular turnover and improve circulation for brighter, smoother skin. Active ingredients include retinol, resveratrol, grape extract and antiaging peptides. 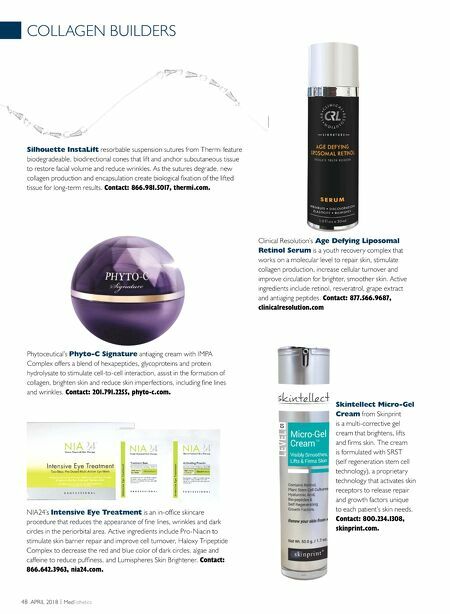 Contact: 877.566.9687, clinicalresolution.com Phytoceutical's Phyto-C Signature antiaging cream with IMPA Complex offers a blend of hexapeptides, glycoproteins and protein hydrolysate to stimulate cell-to-cell interaction, assist in the formation of collagen, brighten skin and reduce skin imperfections, including fi ne lines and wrinkles. Contact: 201.791.2255, phyto-c.com. NIA24's Intensive Eye Treatment is an in-offi ce skincare procedure that reduces the appearance of fi ne lines, wrinkles and dark circles in the periorbital area. Active ingredients include Pro-Niacin to stimulate skin barrier repair and improve cell turnover, Haloxy Tripeptide Complex to decrease the red and blue color of dark circles, algae and caffeine to reduce puffi ness, and Lumispheres Skin Brightener. Contact: 866.642.3963, nia24.com. Silhouette InstaLift resorbable suspension sutures from Thermi feature biodegradeable, biodirectional cones that lift and anchor subcutaneous tissue to restore facial volume and reduce wrinkles. As the sutures degrade, new collagen production and encapsulation create biological fi xation of the lifted tissue for long-term results. Contact: 866.981.5017, thermi.com. Skintellect Micro-Gel Cream from Skinprint is a multi-corrective gel cream that brightens, lifts and fi rms skin. The cream is formulated with SRST (self regeneration stem cell technology), a proprietary technology that activates skin receptors to release repair and growth factors unique to each patient's skin needs. 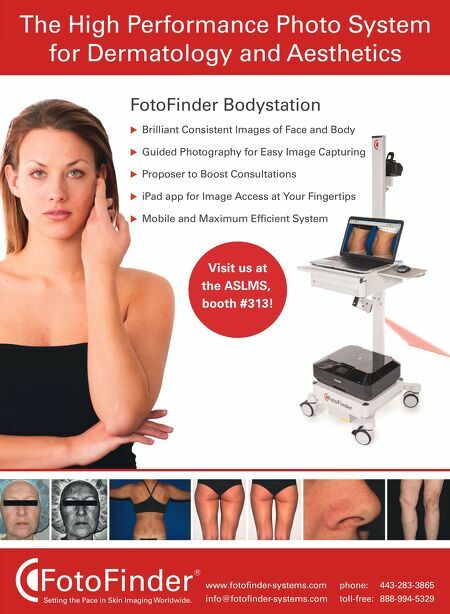 Contact: 800.234.1308, skinprint.com.